Now that the weather is changing fast, it’s time to start digging out those winter woollies again! Missguided offers an amazing and affordable winter coat that is both practical for keeping us warm during the cold months but also very stylish and trendy too. The unique fitted cut of this coat nips in at the waist and helps to accentuate a women’s shape beautifully; it allows you to cheat a nice curvier waist line! 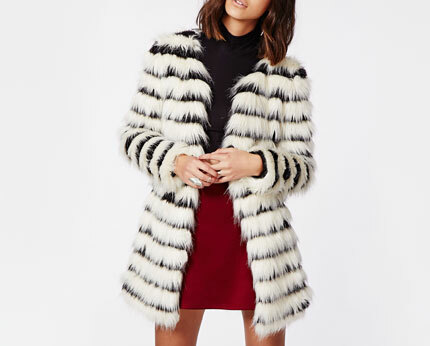 Featuring monochrome faux fur, this coat offers interest with an edgy feel. Perfect for wearing with daywear such as jeans and leggings, but also because this jacket looks stylish and smart, it would be very acceptable to wear a jacket like this to work or over evening wear. All in all, a good all rounder that would easily see you through till spring!